This section is a step by step getting started guide. 1. Drivers delivered on a CD-ROM provided with the camera. These might not be the latest version, so consider option 2. 2. Links to camera manufacturers’ websites can be found at http://www.sharpcap.co.uk/ , in the Supported Devices section or in Camera Controls in this document under the appropriate manufacturer. 3. 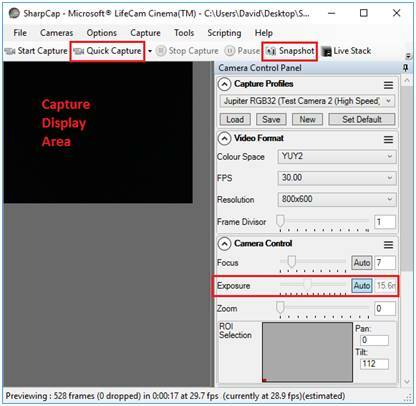 Microsoft supported webcams (which work with DirectShow) may download a driver automatically once the camera is plugged in. This certainly works, for example, with the Microsoft LifeCam under Windows 10. 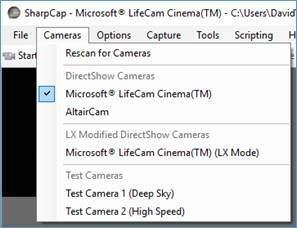 However, earlier versions of Windows require the LifeCam drivers to be downloaded from Microsoft. Once the camera drivers are installed, restart Windows, plug in the camera and check via Control Panel > Devices to see if the device (camera) is working properly. 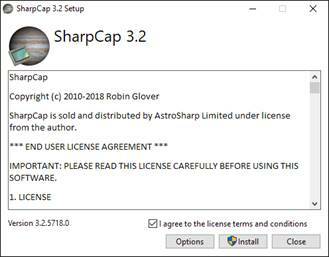 The download and installation of SharpCap is described here. 1. Download SharpCap from http://www.sharpcap.co.uk/downloads . The single download is suitable for both 32-bit and 64-bit versions of Windows. 2. Navigate to the folder where SharpCap has been loaded. Double click on the file SharpcapInstall-version-number.exe to install. 3. Tick the box to agree to the license terms and conditions and press the Install button. 4. Supply an administrator account name and password if requested. 5. 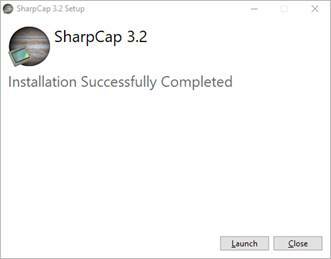 When the Installation Successfully Completed message appears, click Close to close the installer or Launch to run SharpCap straight away. 6. SharpCap is now installed. Consider carrying out the initial testing from inside with the telescope and camera pointing at an object such as a tree, chimney, lamp or mast. Choose a large object. 12. Connect the camera to the telescope. 13. Connect the camera to the PC. 14. Start SharpCap. From the main menu, select Cameras. 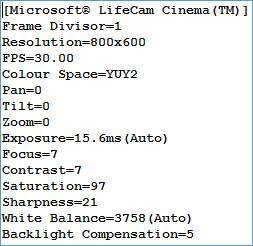 Ensure the camera is selected (ticked) – in this example, the camera is a Microsoft LifeCam. If the camera name appears twice, select the highest one on the list. 15. This is SharpCap’s Main Screen. Capture Display Area – the image the camera sees is displayed here. Quick Capture Button – will start a video capture to a new file. Snapshot Button – will capture a single frame to a PNG file. Exposure – controls the camera exposure. If focusing of the telescope cannot be reached, try removing diagonals or adding extensions. 16. Try the Snapshot button. A Notification Bar will appear directly below the Tool Bar. Click the highlighted link to go directly to the folder holding the captured image. 17. This folder (SharpCap Captures\YYY-MM-DD) which is on the desktop, will contain 2 files. One is the image, the other is a text file containing the camera settings. 19. Try the Quick Capture button. At the bottom-right of the main screen, a progress bar should appear. 20. When this video capture has completed, click the link in the Notification Bar. The capture folder should contain a video file and a camera settings file. Double click the video to play it. 21. If all the above has worked, the SharpCap and camera installation has been successfully tested. See the Appendix for additional (non-essential) clean-up actions.